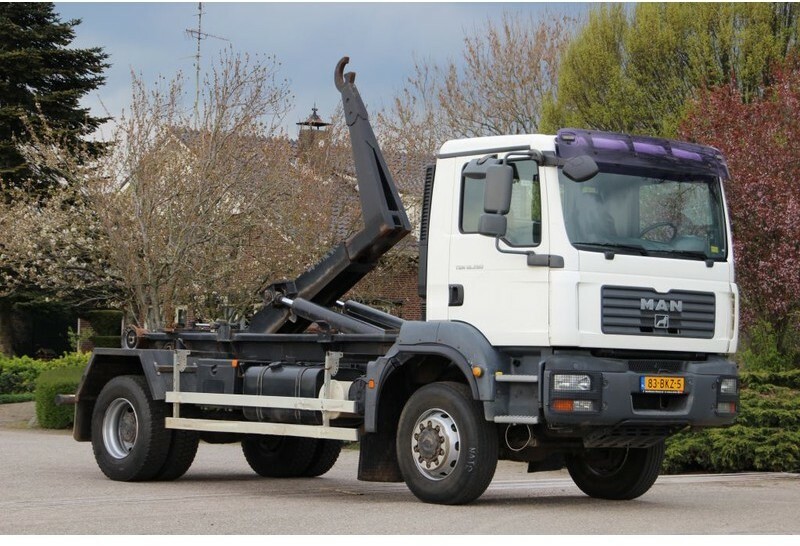 MAN TGM 18/280 !!4x4!!ALLRAD!!HAAKARM!!ABROLLKIPPER!! 90dkm!! Check the technical data of the unit, picked out from the catalog of MAN TGM 18.280 hook lift truck. Engine details/gearing and fuel type: Euro 4, diesel, displacement: 6871 cc, engine cylinders: 6, 280 hp, differential lock, gearbox: manual, transmission: Schaltgetriebe, power take-off. Wheel formula and suspension type: suspension: spring, 4x4, number of axles: 2, steering axles, wheel base: 4500 mm, ABS, front tires: 70%, rear tires: 70%. Cab comforts include sunvisor, power windows, air conditioner, cruise control. The mileage is 89901 km. If you need to get more information, please contact us. Good luck in your deals with !